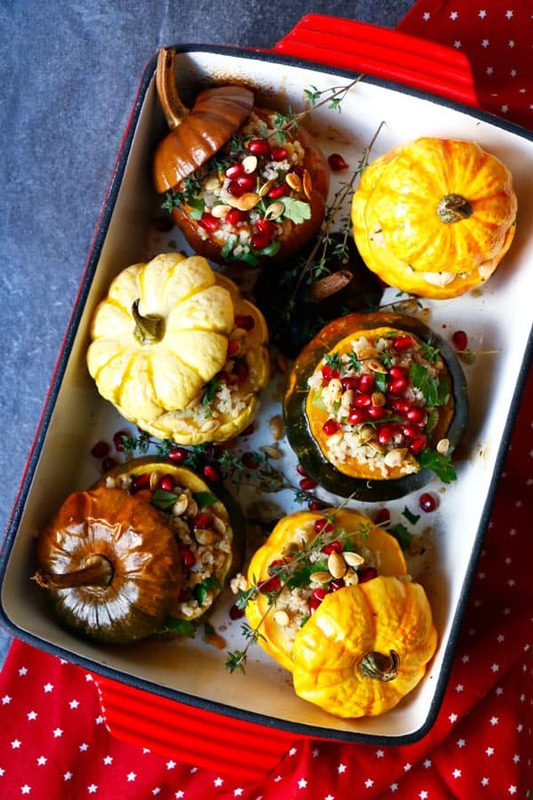 We’ve got two months left in the year with Thanksgiving and Christmas around the corner and so I’m getting all festive on the blog today with this Quinoa Stuffed Squash with Walnuts and Pomegranate. 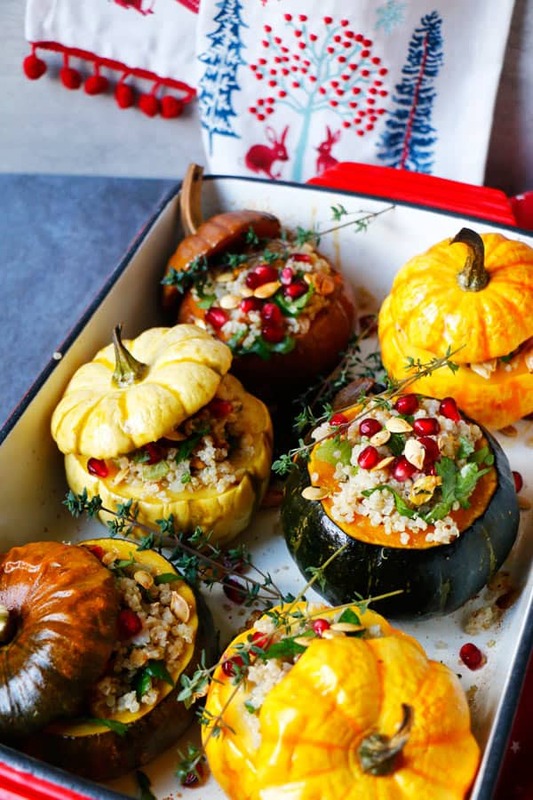 I got a lovely winter squash selection from one of my favourite organic producers, just perfect to create a special plantbased, seasonal and super wholesome meal that’s perfect for the upcoming holiday season. For this recipe I’m collaborating with Debenhams on their Christmas-themed recipe campaign. They’ve sent me some lovely products from Ashley Thomas Christmas collection including tea towels, oven gloves, apron, cake tins and tea cozy and I have to say it’s already getting me into the mood. Their Christmas print tea towels are my favourite and I’m looking forward using them during Christmas this year. Special thank you to Debenhams for sponsoring this post. 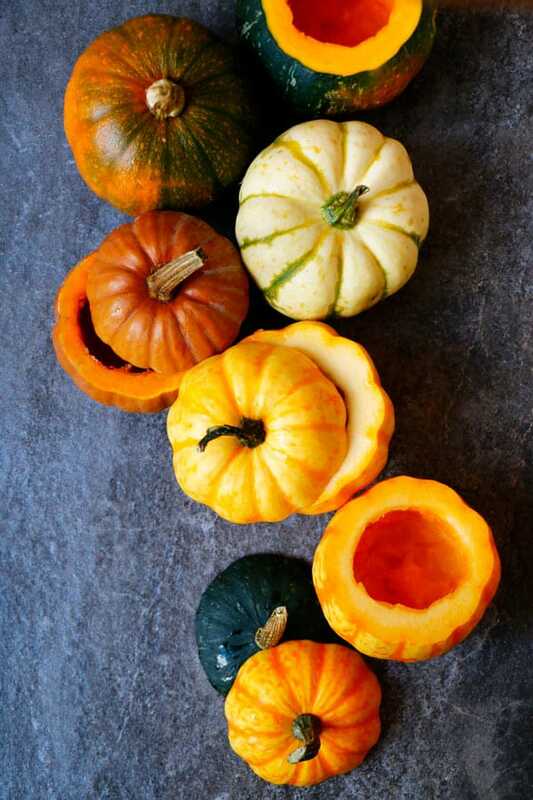 Wash the squash and cut about ¼ to ⅓ from the top to make a lid. Scoop out all of the seeds and save to use later. Rub the outside and the inside with little olive or coconut oil and season with sea salt. Place onto a baking tray with the lids on and bake for 40-45 minutes until soft when pierced with a fork. Separate the seeds from the fleshy part (very fiddly) and rinse in warm water. Pat dry and place onto a baking tray. Toss with little olive or coconut oil, thyme, oregano, sea salt and pepper and roast for about 20-25 minutes until slightly brown and crispy. Roast the walnuts for about 10 minutes until fragrant. Measure 1½ cup of quinoa, place into a mesh strainer and rinse under running water. Place into medium pot and cover with 2¼ cup water. (1½ times the volume of quinoa) Bring to boil, cover with lid and simmer on a low heat until all of the water has been absorbed. Leave to stand for 10 minutes covered and fluff up with fork. In a medium pan heat 2tbsp of olive or coconut oil, add chopped onion and celery and saute for about 5 minutes, add garlic, thyme and oregano and cook for 5 more minutes. Stir in aduki beans if using and season with sea salt and black pepper. Stir the mixture into the cooked quinoa, add roughly chopped walnuts, chopped fresh parsley and season to taste. Stuff each of the squash with the mixture and place back into the oven for 10 more minutes to warm through before serving. 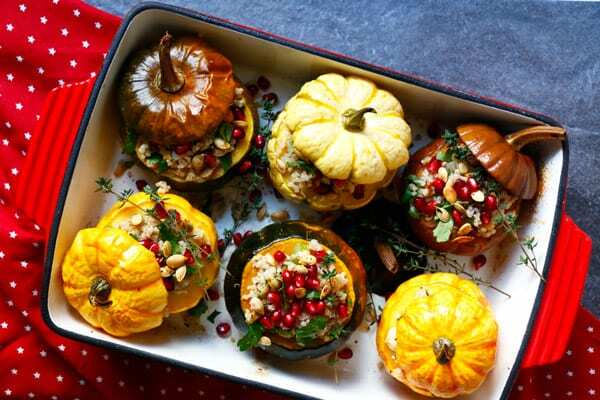 Top with pomegranate, fresh parsley, thyme and freshly roasted squash seeds. Such a beautiful, wholesome, comforting recipe! Love this time of year for food. Hi Jan, mine got eventually crunchy, I kept them in the oven until they were crispy enough, just before they started turning brown. Can this be made in advance? Is so how long in advance? Thanks so much! Could they be any prettier? I love the festive feeling I get just by looking at them! 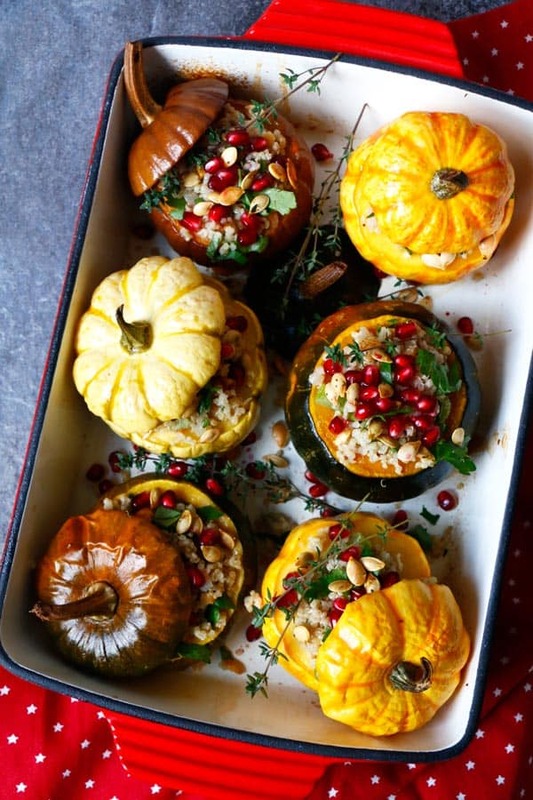 :) Beautiful photos and what a yummy recipe! What are Aduki beans? Could I substitute or leave them out? Thanks in advance. Hi Andi, they are small red beans, sometimes also called adzuki. You can definitely leave them out or substitute them with chickpeas. Hi Priscilla, I find that they taste the best freshly made and eaten right away. But you could certainly make them one day in advance and re-heat them in the oven before serving. Can this be made with “pork” like beyond burger sausage? If so, what spices and augmentations do you recommend? Hi Christine, do you mean a vegan style mince mix? If so, you could use fresh sage, rosemary and thyme for seasoning. It would go lovely with the squash. 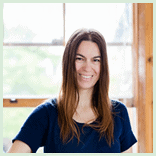 Your photos and recipes are beautiful. Thank you so much Cristina.